Traditionally, the UFC produces one of its four best cards during Memorial Day Weekend. This year’s UFC 187 did not disappoint! Even with the Jon Jones situation and Khabib Nurmagomedov getting injured, the main card in particular served up stellar performances from Joseph Benavidez, Andre Arlovski, Donald Cerrone, Chris Weidman, and Daniel Cormier. Also, Travis Browne, Vitor Belfort, and Anthony Johnson gave us intense moments to cheer or bite our nails for, depending on where you placed your bet. With champions and contenders populating the fight card, it’s but natural that experts and fight fans began speculating about potential matches for the victors (and losers) moments after the event concluded. So what are the matches that would make sense in the near future? Sidelined by an ACL injury, Dodson knew that he had to show the world that he was ready for another shot at the title. While unable to vanquish his foe in the usual clobber-knocker style we’ve known him for, John fought hard to earn a unanimous decision victory against former Bellator bantamweight champion Zach Makovsky. Crediting ring rust for his uninspired showing, Dodson’s lightning fast speed and crisp technique brimmed nonetheless in this fight. “The Magician” is now on a three-fight win streak and is the clear choice to face the champion again. Two years ago, Dodson gave Demetrious Johnson the fight of his life during their first meeting. Since then, “Mighty Mouse” has practically wiped out his entire division, and Dodson with his dynamite hands is the only foreseeable threat to DJ’s title reign. Joseph Benavidez’s spot in the flyweight division is a very confusing and frustrating place to be in. He has already lost to the champion twice, but he still beats everyone else in the division. He’s practically a gatekeeper in one of the shallowest divisions in the UFC. Given his peculiar situation, he’ll probably serve as the litmus test for all would-be contenders. This match makes a lot of sense because it’s obvious the UFC is setting up Henry Cejudo to get a title shot in the near future. As you may know, Henry Cejudo is an Olympic gold medalist in wrestling. And what better way to test that Olympic-level wrestling than to pit him against a beast like Benavidez. 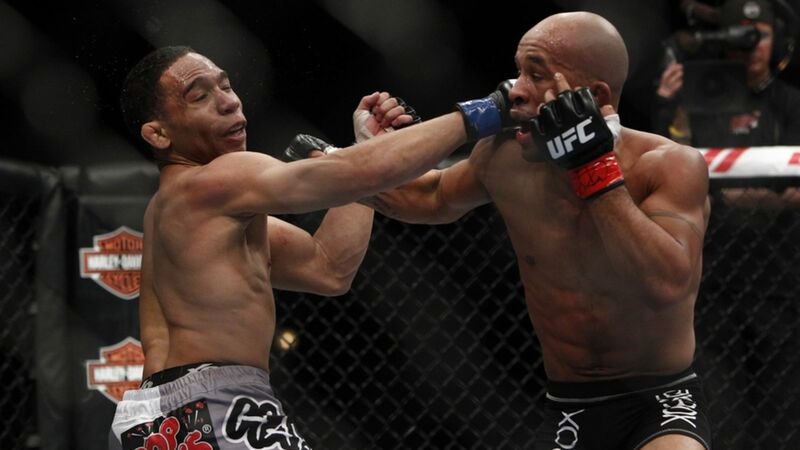 After UFC 187 win, is title rematch next for Filipino-American John Dodson? The Ultimate Fighter Season 14 bantamweight winner, and current number-one ranked flyweight contender John Dodson came back from a knee injury to fight close friend and fellow top 10 flyweight Zach Makovsky at UFC 187. Dodson did just enough to take the decision win, with 29-28 on all three judges’ scorecards. It was not a fight with the usual frenetic action fans have come to expect from “The Magician”, but Dodson explained that he had some ring rust after almost a year on the sidelines, and still believes he should be the next one to challenge for Demetrious Johnson’s flyweight title. Johnson and Dodson have met in the Octagon before, with Johnson outpointing the challenger 48-47, 49-46, and 48-47 back in January 2013. The son of an African-American father and Filipino-American mother, Dodson first established his presence in the UFC by scoring a TKO over T.J. Dillashaw to win his season of The Ultimate Fighter, a feat made even more impressive considering the fact that Dillashaw is currently the UFC bantamweight champion. Dodson then promptly dropped down to flyweight, where he established himself as one of the most powerful strikers in the division. His flyweight record now stands at 5-1, his lone loss to the champion.